To be honest, I don't put the garden to bed in the traditional sense. I like to garden all year long and for the most part, the weather in the Pacific Northwest lets me do that. January is probably the only month I don't do much gardening. There are a few clean-up tasks, however, I like to do in the fall. 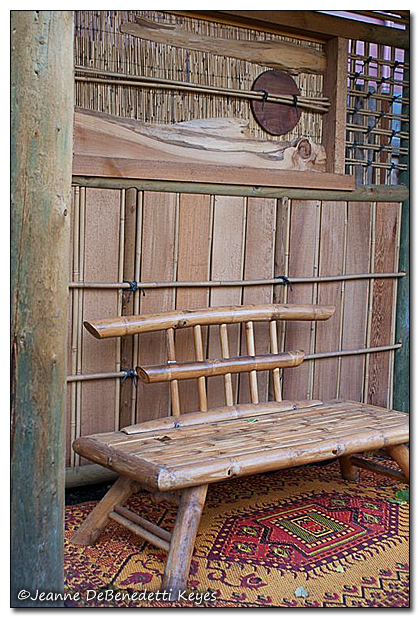 First, I put all benches, art, fabrics, pots etc. that cannot endure extreme wet or cold conditions back into the shed or garage. The rug is plastic and although it is mostly underneath the arbor, I don't want it to get slimy with algae, so I roll it up and store it in the shed. I put the bench back in the shed too. I would love to keep it out so I could sit with a cup of hot coffee and enjoy my winter garden, but some of the finish is already coming off due to the moist, Autumn air. Hmm, maybe it just needs another coat of varnish. Next, I weed all of the beds, as best as I can and put down mulch to suppress the remaining weeds, protect tender plants and make the beds look tidy. I like to plant cover crop such as fava beans, crimson clover, rye grass and buckwheat in the vegetable garden to again suppress weeds, protect the soil from runoff and improve soil health. Besides, it looks so much nicer to see lovely, low, green plants in the bed instead of bare dirt. This year, I am also planting white clover. I think it will look nice with the crimson clover next spring. The cover crop will die if we get snow or an extended period of cold, dry weather, but I have found that replanting the cover crop in February works well and keeps the ground covered until May, when I can get the warm season vegetables into the ground. 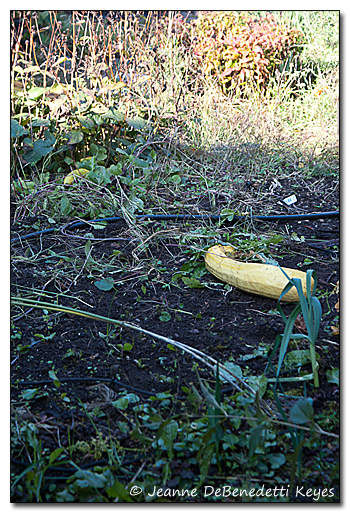 Oh, word to the wise: Put all old, overgrown vegetables into the compost pile! 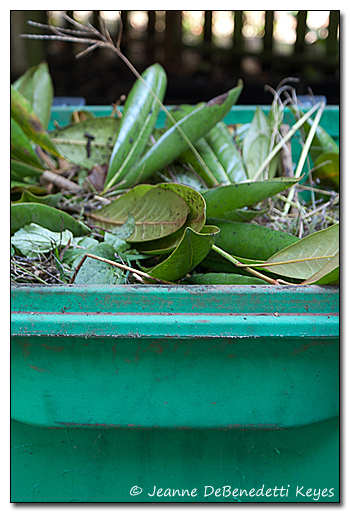 Next, I fill the yard debris bin with weeds, small, woody debris and any plants such as ivy or other invasives that I don't want in the compost piles. Keeping those weed seeds out of the compost is the best thing you can do to reduce the amount of time you spend weeding next spring! Lastly, I like to leave all living plants, seed pods, and grasses standing through the winter to provide food for the birds and also to protect the plants from cold, drying winds. I have been experimenting with raking the large red oak leaves back into the native plant beds along with leaving all the leaves from the shrubs in the beds to decompose in place. Generally, gardeners are advised to clear leaves out of the beds to prevent slugs and cutworms from wintering over under the leaves. So far, I have not observed an increase in the slug or cutworm population. Is this just being a lazy gardener? Well sure, but the leaves also feed the soil by adding organic matter, protect the soil from rain and it suppresses weeds. If you don't put something down to cover the bare dirt, Mother Nature certainly will!